Synopsis: This film was actually released last year in many countries and is now nominees to many categories in the upcoming Oscars. The movie is basically about a land baron tries to re-connect with his two daughters after his wife suffers a boating accident. Verdict: Four months too late for a premiere, this one is. I’m sure not many hasn’t seen it yet considering that it won two of the big awards at the recent Golden Globe Awards and how many nominations it has earned for the coming 84th Academy Awards. But well, it’s Malaysia. 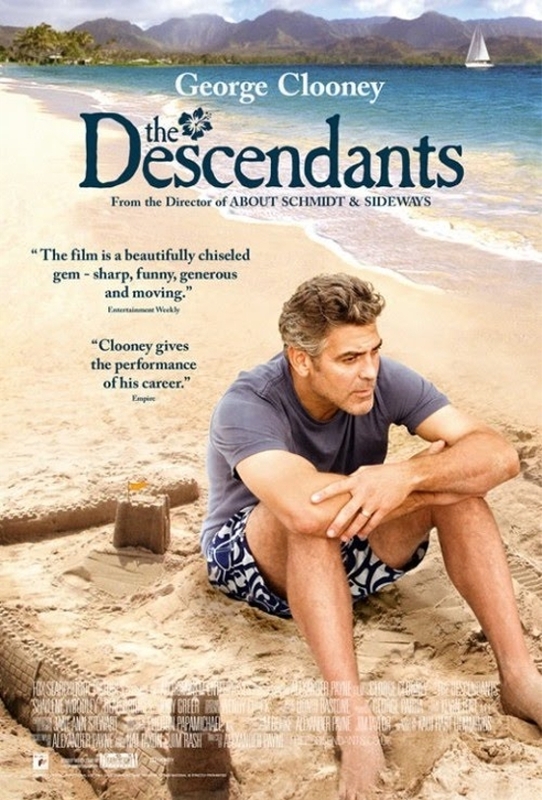 Good memories should live on and life should go on – the simple message The Descendants sends to viewers. Well written screenplay, emotionally engaging, perfectly paced, beautiful Hawaiian setting and music used, and great performance by the actors, particularly George Clooney. However, rewatch value nil. Factual error: “Early in the film, there is talk about donating Elizabeth’s organs. If they really intended to do that, they would not have taken her off the ventilator and allowed her to die a slow death, as that would cause permanent hypoxic damage to the organs. They would have declared her brain-dead, and harvested the organs promptly, while she was still breathing” (IMDb). So why does… [SPOILER BEGINS HERE] Matt King (Clooney) decide not to sell the land at the end? There are many ways of looking at it and probably has no right answer. Could be because he doesn’t want Brian Speers (Matthew Lillard) to get the commissions. Or perhaps because he is on the general public’s side that do not want it to be sold. Or probably because he feels the land is a part of the family from past to the present and has to stay for the future (memories of he, his wife and Alex; Scottie hasn’t spent time on the land with the family before; the ashes of the wife are scattered around there). Or simply because it just doesn’t feel right to sell it when it’s entrusted to him, plus he’s already quite wealthy. Or maybe he just doesn’t want his cousins to spoil their families, just like how he doesn’t spoil his (“Give your children enough to do something but not enough to do nothing.”) [SPOILER ENDS HERE]. Do you think it’s gonna win the Best Picture award at the Oscars? It shouldn’t. Highly doubt it. Rated 18 in Malaysia? Don’t ask me why. For the F-words and middle fingers perhaps. But as all we locals already know, our beloved film censorship board is a joke. Nothing are censored, by the way. Second opinion: “Liked it, enjoyable ’cause it’s not super sad” (Iris Loong). Special thanks to Nuffnang for the invitation to the local premiere screening of the film. probably the 18+ rating for the death scenario and all. Our censorship board may think it's too much for our kids to take, forgetting that the internet has more deaths in it that any movie can reproduce. I really liked that saying "Give your children enough to do something but not enough to do nothing." I didn't like it at all! To me, it was too slow-paced and Matt King was too good to be true. I mean, can you actually be like him and just keep quiet while your father-in-law perpetually blames you for what happens to your wife and goes on and on about how his daughter was a "faithful, good woman"? If I were him, I would've said, "LET ME TELL YOU ABOUT YOUR GOOD-FOR-NOTHING DAUGHTER!" But he didn't say a word. Not a thing. Which I felt made it even harder to relate to him. If he had just one, just one minor outburst, I would have attached to his character immediately.